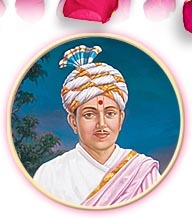 Bhagatji Maharaj was the second spiritual successor of Lord Swaminarayan after Aksharbrahman Gunatitanand Swami. His life, a shining inspiration to all seekers of truth and redemption, is a story of ultimate devotion and unconditional surrender. Born into a humble tailor family, Pragji was irresistibly inclined to spirituality. He often led friends away from school toward mandirs, saying, "I love the lessons that devotion teaches." He accepted Gunatitanand Swami as his Guru and served him - in thought, word and deed - obeying his every command. He silently tolerated hardships, performed great austerities and conquered the three states of waking, dream and deep sleep. Pragji soon became Bhagatji Maharaj. Although a perfect renunciate, he was asked to accept the life of a householder. However, this did not deter many well known scholars and sadhus from accepting him as the Guru, because Gunatitanand Swami had revealed Bhagatji Maharaj as his next successor. Bhagatji openly began to preach Lord Swaminarayan's true philosophy of Akshar Purushottam, which till then had been the privilege of a select few. To those who accepted this philosophy, he promised, "I shall take away your robes of illusion and give you robes eternal. Life Span: 68 years (1829 - 1897CE). As Guru: 30 years (1867 - 1897 CE).